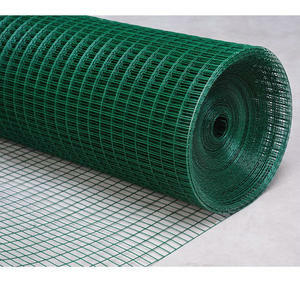 Full range of green PVC coated galvanised welded wire mesh rolls. Choose from 0.9m, 1.2m, 1.5m 1.8m and 2.4m wide rolls for fencing applications. We stock a variety of weld mesh with wire thicknesses from 1mm, 1.6mm, 2mm, 2.5mm and 3mm before their plastic coating. Mesh apertures range from 12mm, 25mm and up to 50mm square. 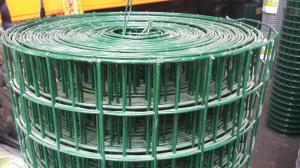 PVC coated welded wire mesh rolls are used as garden fences, tree guards, dog runs and boundary fences. PVC coated welded wire mesh fencing can be installed by nailing to timber posts using galvanised u-nails or by using nylon cable ties. With all mesh fences we strongly recommend using a tensioning galvanised line wire connected to the wire mesh using hog rings or similar and will keep the fencing taut and solid.